The question shouldn’t have an obvious answer. If Andreas Kluth taught me anything it’s that success can be found in failure and failure in success – triumph and disaster are two impostors. The Republicans definitely won big in the electoral battle. But why did they win so big? Many Democrats and people like myself have argued that it can all be boiled down to “the economy is bad, the Democrats were in power, therefore the Democrats lost a lot of seats.” There are also historical and structural reasons to expect big Democratic loses (e.g. They had a big majority so even a 50/50 partisan vote split would result in many lost seats). 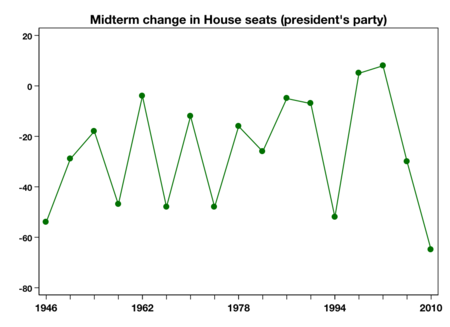 Here’s a chart showing midterm changes of House seats for the President’s party. Although the economy and structural factors played the biggest role it appears the Democrats lost a significant number of seats because they supported policies lots of people in the country don’t like (here and here) – especially healthcare. The political scientists at The Monkey Cage find (with all the appropriate caveats that we bloggers often fail to trade in [that’s why I always suggest reading the source]) the big controversial votes (Healthcare/Cap&Trade) may have cost the Democrats around 24 seats and possibly even tipped the scales on who controls the House. Pundits and politicians who are interpreting the midterms as a referendum on Obama’s agenda, however, would be wise to read the forthcoming book of MIT political scientist, Gabriel Lenz. Lenz convincingly demonstrates that policies subjected to intense public debate rarely become more important determinants of citizens’ vote choices. Instead, voters will more often first pick a candidate based upon partisan and performance factors and then adopt that politician’s views about high-profile policies. So, for example, voters who decided to vote for Republican candidates in the midterms because of the poor economy would also be more likely to embrace that party’s position on health care reform. I’m not going to pretend I can settle what is essentially a scientific question, but let’s pretend that we know that the Democrats lost the House because of their votes on unpopular policies. It’s not that far-fetched to think voting to cut $500 Billion in medicare would cost somebody an election. What would the lesson be for the Democrats? Should we answer our first question that the Democrats lost? If the Democrats had known ahead of time that not passing any of their policies would have allowed them to maintain control of the House and they had therefore not passed any of their signature legislation that’s possibly the definition of success as an impostor. If I may borrow some more from Andreas, the Democrats could go from success to success, winning election after election as Hannibal won battle after battle in Italy. Yet, the purpose of winning battles is to win the war; Italy never completely fell and Hannibal’s Carthage was “razed it to the ground so thoroughly that modern archeologists had quite a time just locating the site.” The purpose of winning elections is to pass legislation. David Frum tried to warn Republicans. Republicans may gain political benefit, but Democrats get the policy. In this exchange, it is the Democrats who gain the better end of the deal. Congressional majorities come and go. Entitlement programs last forever. History is on his side; today we have the GOP scaring seniors because the Democrats are cutting entitlements. There should be no doubt that given enough passage of time this new healthcare entitlement will be seen as just as fundamentally unchallengeable as social security and medicare. There is plenty to criticize about the Democrats’ policies, but you might not want to argue that they caused the Republicans to “win.” The Republicans won the battle, but the Democrats’ legislative architecture remains. Historians may be just as mystified about major Republican policies as they are about Carthaginian columns. To answer your question on “what would the lessons be for the Democrats?”, assuming that, as suggested, the Democrats are the party of policy, perhaps their take home message should be timing, incrementalism, and “throwing the dog a bone”. Perhaps the timing for healthcare reform was wrong, particularly in light of the economic concerns facing the country. Perhaps incremental changes in healthcare could have been implemented without the backlash of a major overhall. For example, some of the more popular components of the legislation could have been brought forward first. Last, throw the Republicans a bone. For example, in healthcare reform, make an effort to include tort reform. I agree to a certain extent. But I worry that if timing became a driving concern nothing would ever get done. I’m not sure I believe this, but it’s possible that no matter when health reform was done given all the status quo interests aligned against it it would always be a vote loser. I don’t want to rehash the whole healthcare debate but I still think that a healthcare bill that was basically modeled on Romney’s plan, it guaranteed insurance through the private sector, and didn’t include a public option so it did throw “the dog a bone.” I encourage you to read David Frum’s piece I linked. He’s more conservative than I am and argues that the GOP could have pushed the legislation in a much more conservative direction had they compromised and worked with Obama at the time. Of course, you’re right that the Democrats could have made the policy better (if you believe tort reform is better) on their own. I wish they had. They shouldn’t need Republicans to push them toward better policy. But given the realities of our political system, it seems inevitable that we need a second party to extract concessions like tort reform – the Democrats, after all, are heavily linked to lawyers and it would have gone against their self-interest without achieving any sort of greater progressive ambition. That’s why although I’m by no means conservative, I still wish for a sane responsible party instead of whatever today’s GOP is. Also, I don’t want to give the impression that I think the Democrats are some kind of principled based party that we should all admire for the strong stands they always take. It’s just that relative to the current GOP they look a lot better. Anyway, people always say they want politicians to make tough decisions, but once they do they say they are subverting the will of the people. As a general rule of thumb I think everyone should always vote against the majority party because government is bad and we need to get rid of these jerks. I am slowly going crazy 1 2 3 4 5 6 switch, crazy going slowly am I 6 5 4 3 2 1 switch.